LANCASTER, PA--(Marketwired - Sep 22, 2016) - Fulton Financial Corporation (NASDAQ: FULT) today announced the creation of Fulton Forward™, the Corporation's initiative to further promote the building of vibrant communities through programs, products, and services, designed to foster affordable housing, drive economic development, and promote education and financial literacy in the neighborhoods served by its banking subsidiaries. In a related announcement, Fulton Financial Corporation announced the formation of an alliance between the Corporation, its banking subsidiary, Fulton Bank, N.A., and Operation HOPE, Inc., a global financial dignity and economic empowerment nonprofit. The alliance will provide credit and money management counseling, as well as funding assistance to underserved individuals and communities in its market footprint in an effort to promote homeownership. "An important part of our Fulton Forward™ initiative is partnering with great organizations like Operation HOPE that share our goal of promoting home ownership to low- and moderate-income and minority individuals and communities," said E. Philip Wenger, chairman, president and CEO of Fulton Financial Corporation. "Operation HOPE is pleased to be part of this advancement of Fulton's efforts to impact and uplift disenfranchised communities," said John Hope Bryant, founder, chairman and CEO of Operation HOPE. "This new alliance will allow Operation HOPE to expand the breadth of its geographic reach, to teach people the language of money, transform financial mindsets, and give people the tools they need to develop plans to move their lives forward by raising their credit scores, buying homes, or simply making better decisions with the money they have." Fulton Financial will increase its emphasis on financial literacy by offering HOPE Inside, a variety of financial dignity and empowerment counseling programs that will be provided free to clients at local Fulton Bank branches. As part of this initiative, Operation HOPE will locate a member of its team in certain branches, with increasing coverage over time. Initially, Operation HOPE's Financial Wellbeing Coaches will be located at Fulton Bank's downtown Reading, PA branch to assist potential mortgage customers, on an as-needed basis, with financial literacy training and credit rehabilitation services. FFC has already held 45 seminars for first-time homebuyers this year. Also, as part of its Fulton Forward™ initiative, Fulton Bank and Operation HOPE are collaborating on the launch of a Closing Cost Assistance Program that is designed to boost home affordability. Under this program, eligible borrowers will receive grants of up to $2,500 toward closing costs, including down payment assistance. The program will be available in all of the communities served by Fulton Bank in Pennsylvania, Delaware, and Virginia. The HOPE Inside initiative noted above will provide additional referrals to this program. In conjunction with the launch of the program, Fulton Bank, N.A. has also made a charitable contribution to Operation HOPE to support Operation HOPE's efforts in underserved communities. The Fulton Closing Cost Assistance grants can be paired with Fulton Bank products that are also designed to provide benefits specific to underserved individuals and communities, including Fulton's recently enhanced Homebuyer Advantage Plus® (HBAP) mortgage loan product. The combination provides greater opportunities for potential customers to gain approval for a mortgage due to reduced qualification requirements and increased funding. Through July 31 of this year, Fulton Bank has already seen a 200 percent increase in new HBAP loans, year-over-year, and in July of this year, new HBAP loans were three times that of July 2015. The Fulton Forward™ initiative, and the alliance with Operation HOPE, were established for the purpose of enhancing FFC's focus on lending to underserved communities and individuals. These efforts are part of FFC's broader Fair and Responsible Banking strategy. Community outreach has long been a cornerstone of FFC's business model, and today's actions further the company's efforts to reach the broader communities served by the Corporation. Residential mortgage lending is offered by all banks under the Fulton Mortgage Company brand. Operation HOPE, Inc. (HOPE) is moving America from civil rights to "silver rights" with the mission of making free enterprise and capitalism work for the underserved. Since 1992, through its core programs, the nonprofit has provided financial dignity and economic empowerment to over 2.6 million individuals worldwide, and $2 billion in economic activity for the disenfranchised -- turning check cashing customers into banking customers, renters into homeowners, small business dreamers into small business owners and minimum wage workers into living wage consumers. Project 5117 is HOPE's multi-year four-pronged approach to combating economic inequality that aims to improve financial literacy, increase business role models and business internships for youth, and stabilize the American dream by boosting credit scores. Operation HOPE recently received its second consecutive 4-star charity rating for fiscal management and commitment to transparency and accountability by the prestigious non-profit evaluator, Charity Navigator -- further establishing it as a best-in-class organization. Fulton Financial Corporation/Fulton Bank, N.A. 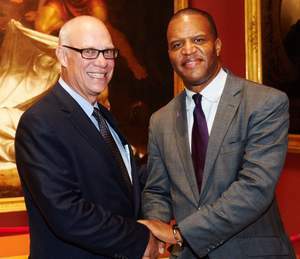 E. Philip Wenger, chairman, president and CEO of Fulton Financial Corporation (left), and John Hope Bryant, founder, chairman and CEO of Operation HOPE (right).